Neutralise unwanted brassy tones with the Pureology Strength Cure Best Blonde Trio; a refreshing shampoo, conditioner and spray developed specifically for blonde hair. A colour-correcting formula infused with deep purple pigments to help eliminate yellow undertones in highlighted or blonde hair. 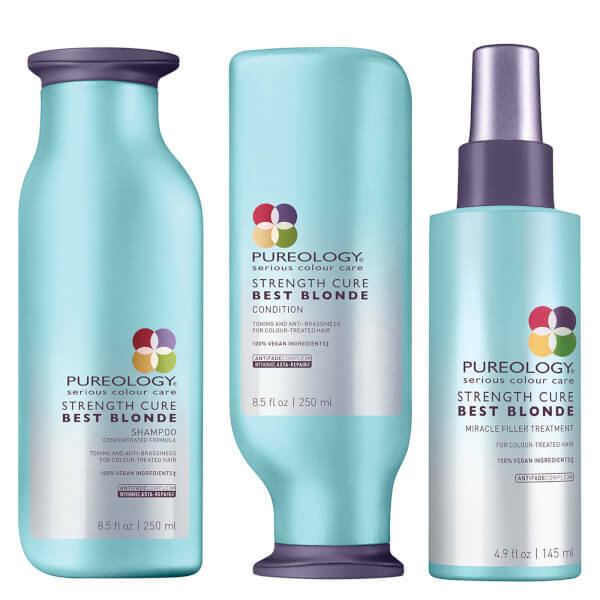 When used with the Best Blonde complete system, the purple shampoo expertly cleanses, nourishes and strengthens fragile, over-processed hair, whilst protecting colour vibrancy and promoting bright, luminous locks from root to tip. Lightweight and non-greasy, the daily miracle spray fills in gaps in delicate, porous hair, whilst helping to restore softness and shine for salon-worthy results. The brand's innovative AntiFadeComplex preserves colour vibrancy to reveal strong, glossy locks with minimised brassiness. Ideal for all shades of highlighted blonde hair. Shampoo: Apply a quarter sized amount into wet hair. Leave in 1-3 minutes (for warm blondes), 3-5 minutes (for neutral blondes) and 5-15 minutes (for cool blondes). Rinse. Conditioner: After shampooing, massage conditioner into hair and scalp. Leave in 1-3 minutes (for warm blondes), 3-5 minutes (for neutral blondes) and 5-15 minutes (for cool blondes). Rinse. Spray: Apply to damp hair daily. Blow-dry and style as usual. In case of contact with eyes, rinse them immediately. Spray: Aqua / Water / Eau, Cocos Nucifera Oil / Coconut Oil, Amodimethicone, Polyquaternium-37, Ppg-5-Ceteth-10 Phosphate, Phenoxyethanol, Propylene Glycol Dicaprylate/Dicaprate, Parfum / Fragrance, Acetamide Mea, Lactamide Mea, Dimethicone Peg-7 Phosphate, Hydrolyzed Vegetable Protein Pg-Propyl Silanetriol, Behentrimonium Chloride, Trideceth-6, Ppg-1 Trideceth-6, Coriandrum Sativum Oil / Coriander Seed Oil, Xylose, Hexadimethrine Chloride, Tocopherol, Poly(Linseed Oil), Cetrimonium Chloride, Propylene Glycol, Geraniol, Helianthus Annuus Seed Extract / Sunflower Seed Extract, Chamomilla Recutita Extract / Matricaria Flower Extract, Citrus Medica Limonum Extract / Lemon Fruit Extract, Ci 42090 / Blue 1, Ci 17200 / Red 33, Sodium Hydroxide.